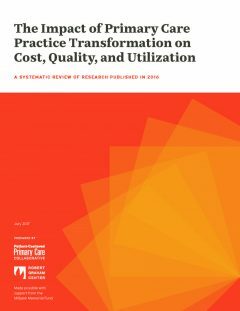 The Patient-Centered Primary Care Collaborative (PCPCC) has released a new evidence report, “The Impact of Primary Care Practice Transformation on Cost, Quality, and Utilization,” that links the patient-centered medical home (PCMH) and other forms of advanced primary care with improved outcomes in many studies. The report, published with support from the Milbank Memorial Fund for the fourth time, highlights findings from 45 newly released peer-reviewed reports and additional government and state evaluations. Authored by the Robert Graham Center, the report differs from those in past years since researchers employed broader search terms and more rigorous search criteria in their assessment of studies, reports, and evaluations published between November 2015 and February 2017. It also features examples and data from PCMH programs; the Comprehensive Primary Care Initiative launched by the Center for Medicare and Medicaid Innovation; and state primary care initiatives, including Colorado, Minnesota, and Oregon. Overall, analysis of the studies revealed that the longer a practice had been transformed, and the higher the risk of the patient pool in terms of comorbid conditions, the more significant the positive effect of practice transformation, especially in terms of cost savings. Peer-reviewed data, both federal and state-specific, showed either a trend towards a positive effect on quality, or no impact on quality, though few results were statistically significant. All studies that reported on patient satisfaction showed positive results. “It is vital to continue studying and evaluating what is and is not working with primary care transformation, given the impact it has to improve patient outcomes and the investment on the part of the federal government, states, and commercial payers in PCMH and other strategies to advance primary care,” said Koller.